Imposter syndrome is pernicious and common. It featured prominently in the discussion in the comments on the AUA post on ecology in developing countries. It’s common among grad students I’ve spoken with at institutions all across the US. I’ve had conversations with people who’ve told me about being at meetings at the National Academy of Sciences or with other HHMI investigators where they felt like imposters. Neil Gaiman has a blog post where he talks about having a conversation with Neil Armstrong about feeling like imposters. As I said at the beginning, I find it both comforting to know how common it is and also depressing — I mean, if Neil Armstrong feels like an imposter, what hope is there for the rest of us? Given how common it is, I’d love it if there was a discussion in the comments about how people deal with their own imposter syndrome (or what advice they give others who are feeling impostery). Some things I try are imagining what I’d tell a friend who was in my situation and telling myself that – we’re often much harsher with ourselves than with our friends. 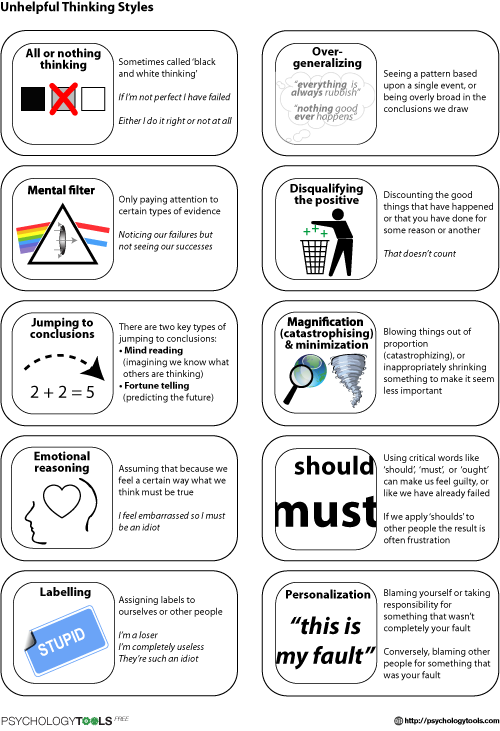 I also find it really helpful to review the list of common cognitive distortions (also called unhelpful thinking styles) and to think about how different things I’ve been doing fit in there. More generally, I find cognitive behavioral therapy and mindfulness approaches really helpful. And, since realizing that my imposter syndrome has been notably worse lately, I’ve gotten much better about doing daily meditations. This entry was posted in Advice, Issues, Navel gazing, Process of science and tagged mental health by Meghan Duffy. Bookmark the permalink. Meg, I love these cartoons. I hope you put exactly the “right” amount of effort into them. 🙂 My own cartooning skills are similarly limited, and I never would have considered using cartoons as a medium except for the enormous success of XKCD, which convinced me that even stick people can do the job sometimes. Perhaps Randall Munroe is my Neil Armstrong? 🙂 I love xkcd and also have enjoyed the Parenting Illustrated with Crappy Pictures and Hyperbole and a Half blogs in the past, which gave me hope that my poorly drawn cartoons might still be useful! Yes! I thought about Parenting with Crappy Pictures too. There is something so liberating about being reassured by expertly drawn crappy pictures that your best efforts are good enough. As I pursue my PhD, beside the Gaiman quotation, is one from Heraclitus: “You could not step twice into the same river.” What I’m doing is mine and unique and worthy, and it is not possible that the same exact thing could have ever been done before. I’m not sure if Imposter Syndrome (IS) is a rare or a more common condition, but I think all un-diagnosed persons feel a surge of relief as soon as they discover others in the sea of humanity who have been suffering and feeling exactly as they have themselves. It does not hurt when IS persons find that their fellow IS persons are considered to be accomplished and successful. It is my belief that IS is an enabling condition that forces over-study and over-preparation on an already capable mind, leading to academic and scientific success. It is also associated with increased anxiety, and perhaps depression. Yes, I’ve suggested this point of view myself to students who’ve been asked to do reviews (or some other professional task) and who worry that they’re not “ready” or not “qualified”. I tell them that whoever asked them to do the review (or whatever) is an experienced professional whose job it is to choose good people to do reviews (or whatever). So the fact that this experienced professional invited you to do it is excellent evidence that you’re qualified to do it. You should trust that experienced professional’s judgment over your own. The same point of view works for awards, job offers, etc. : well-qualified people picked you. Which shows that you deserved/earned/merited the award/job/etc., at least as much as anyone else did. I certainly wouldn’t claim that this point of view will work for everyone feeling imposter syndrome; probably no “cure” works for everyone. But my students have seemed to find it helpful, so perhaps some others will as well. I’d also add that I try to help my students distinguish between generalized anxiety about being unqualified/unready for anything, and specific concrete reasons for feeling unqualified/unready about a specific task. The former seems to me to be an unhelpful way of thinking. The latter can be helpful, and often is addressable in concrete ways. For instance, say you’re invited to review a paper involving species X, but you don’t feel qualified to do the review even though you’ve worked on species X. Because really the paper isn’t about species X, it’s about topic Y, which you know nothing about. In that case, just decline the invitation and don’t worry about it further. That doesn’t mean you’re an imposter, it just means you’re an expert on X but not on Y and the review invitation was misdirected. It happens, to everyone. Passing on a story that academic economist Nick Rowe shared in an old post here. He said that when he first started his faculty position he felt like an imposter. Felt like a fraud, totally in over his head, didn’t know what he was doing, only a matter of time until everybody saw through him. He went to see a university counselor. The counselor just laughed and said “Every new faculty member we hire comes to me and says that”. Nick said that cured him on the spot. I’m sure I’m not the only one who also struggles at the intersection of wanting to be conscious of my own privilege — and how that has undeniably played a huge role in getting me to this point in my career — and also struggling with self-defeating imposter syndrome. Not thrilled with how I worded that, but I think you get my point! Yes, your point is clear, and I think it’s a good one. Not that people who weren’t lucky enough to win the birth lottery don’t also feel like imposters, of course. Thanks for this Meg. I have known about & struggled with imposter syndrome for nearly 15 years. I don’t have great solutions but I manage to keep it at bay most of the time. One strategy is having a couple of people close to me who really understand it and the pressures of academia (in my case, my husband and a long time friend also in a faculty job). In the moment, they can be much better than me at recognising it and helping me push it down. Another has been recognising when I am ascribing my own impossibly high expectations to other people. Eg is my former PhD advisor really going to read this paper super carefully and decide it is boring and be disappointed in me? No of course not, s/he doesn’t have time for that and anyway has probably written a dud paper or two at some point. Is the person who invited me for the talk really expecting something amazing? Probably not, I’ve been to plenty of invited talks that were a bit meh, but didn’t change my overall opinion of someone’s science. “I’m also starting to recognise that others are too busy to think much about me or my work (which sounds silly and obvious but feels like a relief). I take up WAY more of my own brain space than anyone else’s.” Yes! This is something that helps me with anxiety more generally. As one example: sometimes I’d feel anxious and unable to eat, then get even more anxious because then I’d be worried that other people would notice I wasn’t eating (say, at a work event with food) and wonder what was up. At some point I realized that most people are so focused on what’s going on with themselves that they will never even notice. Realizing that helped me a lot. On this, I’m also remembering your old post on getting over self-consciousness about wandering alone at conferences, Meghan. (https://dynamicecology.wordpress.com/2013/07/01/on-wandering-around-alone-at-meetings/) Like you, I used to feel embarrassed about that, like people would notice that I was a n00b. Until one year at ESA I finally took to heart that no one else notices you. Only you notice you. One positive of imposter syndrome (yes, I have it in droves) is humility. That's what makes most entomologists nice people, perhaps! I totally get this, but I don’t know that I’d put it quite like that personally. I feel like one operational definition of imposter syndrome is “too much humility”. Yes, you should have a healthy awareness of the extent to which circumstances beyond your control have gotten you to where you are today. And yes, lack of that awareness could easily lead to arrogance. But it seems unhealthy to take awareness of how you’ve benefited from circumstances beyond your control to the lengths of imposter syndrome, even taking into account the “positive side effect” of humility. I guess I like to think of impostor syndrome as a necessary evil (or the reverse side of the coin) of avoiding the “been there done that 1000 times, life is really boring” syndrome. When you think about it, impostor syndrome mostly comes from being in new circumstances where we don’t already have a track record of success or sense of having been there and belonging for a while. On my first ever paper I had impostor syndrome. Now its a pretty rare paper (if ever) that I feel impostor syndrome. But I do feel it for my first sole-author book. As a new faculty member.I palpably was trying to figure out how I belonged. Now I mentor new faculty helping them navigate paths that seem clear to me now. As an Editor-in-Chief of a journal, the first papers I took a decision on (referred to an AE or rejected) I felt impostor syndrome (and as a result spent a lot of time on it). Two years and 1200 papers in I never do (and spend much less time but actually make better decisions). Impostor syndrome always come from something new or newish. Doing something new or being in a new situation. So really, there’s an easy way to avoid impostor syndrome, never do anything new! This echos the Gaiman quote about “being slightly out of our depth”. When you think of it, never being out of your depth is not really a good thing ..
And thinking really big, while impostor syndrome feels icky, there are people in life who aren’t lucky enough to be always facing new challenges and situations. There are plenty of jobs that are pretty darn routine. So when I feel impostor syndrome, I just remind myself to be grateful that I don’t have a job working on a conveyor belt with the same motions every hour for every day for 40 years! I agree with Brian and Gaiman. Imposter syndrome is like fear: under control, it can help you, otherwise, it can destroy you. We need to face challenges and ordeals from time to time, so we can move on in our personal journey (sensu Campbell) and grow as professionals and humans. So it’s natural to feel like an imposter for some time, when we cross the threshold of a new, unknown world. But too feel like an imposter all the time, for a long time, is not healthy and points out that something is wrong. There are many possible explanations, and therapy and meditation can help people understand their feelings. For instance, maybe the person suffers from anxiety or depression, and needs professional help. It’s also possible that the person is working with an abusive mentor or sadistic colleagues. Finally, we cannot rule out the possibility that the person is living someone else’s life (i.e., wrong career or job) and needs to find his/her own ikigai. I wrote a lot about my struggles with Impostor Syndrome in my first year of graduate school on my blog – and managed to think of some ways to combat it too! This reminds me that I used to use an approach of writing, at the end of the day, of three things that I was grateful for/happy about. I’d forgotten about that approach! Posts like these! Especially when you find out someone you look up to does/has also felt like an imposter. Seriously, I’ve been on the verge of leaving academia post PhD in a large part due to feeling like I don’t belong/imposter syndrome. Blogs like this make me wonder if I should stay! Imposter syndrome is really, really common! Do you have a mentor who you could talk to for feedback? I also have both the “this was easy so I must have succeeded by luck” and “this was very hard – I must not actually be good even though I got it in the end” kinds of impostor syndrome. Others’ experiences help sometimes, but when the IS is bad the voice in my head is much louder than anything from outside. What I have found helps is to keep something physical with positive feedback (academic awards from high school, positive comments on my thesis). Being able to hold a tangible sign of success in my hands helps me stop filtering out the positive and get a more balanced self-appraisal.